As a real estate professional, you’re undoubtedly aware of the stigma associated with stucco homes, and the real estate transactions that have been ruined by the problems related to stucco. You get a listing on one of these homes, a moisture inspection is completed on it, and any problems that are discovered lead to complications closing the sale. Maybe you’ve experienced it firsthand; maybe you’ve experienced is firsthand, or just heard about it from associates. But you don’t live in fear of it. Now there is a solution – the MoistureFree Warranty. A MoistureFree Warranty provides protection for new homeowners against any moisture problems related to their stucco cladding, but the protection doesn’t stop there. The seller and the real estate professional involved in the sale can rest assured that the transaction won’t come back to haunt them later due to problems with the stucco system. Some agents have been named in lawsuits by stucco homeowners because of their participation in the sale of a stucco home that had problems after the sale. 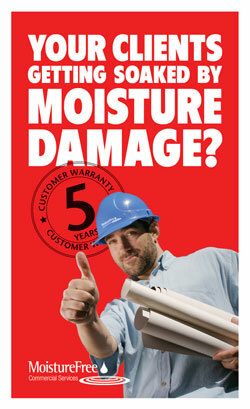 Reduce your risk with a MoistureFree Warranty. The MoistureFree Warranty gives you options that simply aren’t available through other sources. A repair contractor may give you a so-called “warranty” on their work (which is really a "guarantee"), but that guarantee is only as good as the company standing behind it. Who knows if they will be around in the future to honor their guarantee. Plus, repair contractors almost never warrant the entire stucco system, but limit their guarantee to the areas they repaired. Once an inspection reveals problems with the stucco system, one of two things happens; the sale falls through completely, or the buyer asks for major price concessions to offset the repair costs and risk. Neither of these is an option you prefer. By putting a MoistureFree Warranty in place, you assure the buyers that the home has adequate systems in place to protect the home, and warranty coverage if those systems do fail in the future. Example: Rather than discounting the home, a home seller can purchase a MoistureFree Warranty and retain the market price on the home. This can potentially save the homeowner tens of thousands of dollars in price concessions at the time of sale. From 3% to 16% of the sales price of the home can be retained just by having a MoistureFree Warranty already in place, protecting the home, you assure buyers that the home has been through MoistureFree Warranty��s moisture solution process, and that the warranty is in place if a failure occurs in the future. On a $250,000 home, that ranges from $7,500 to $40,000 in home value protection at the time of sale. Further, a MoistureFree Warranty can reduce the time the home is on the market by as much as 50%. .